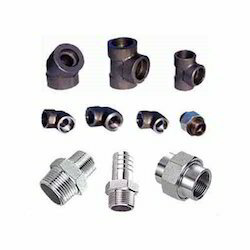 Our expert teams are engaged in manufacturing and selling the best quality of hastelloy forged fittings which are manufactured by high quality of raw material. These products are well known for its quality, durability, smooth ending and corrosion resistance. As a whole seller we sell our products all over the country. Hastelloy Forged Fittings offeredfind usage in areas like pollution control, chemical processing, waste treatment, marine engineering and others. We can make these quality fittings available in finish options of epoxy & FBE coating, electro polish, drawn & expansion and bending buffing with advantages of superior metallurgical strength and resistance to corrosion and rusting. Further, these quality forged fittings also offer torque-free sealing support with leak proof usage even under demanding working conditions. Further, these fittings are also suitable to be used in working environments involving high temperature, pressure and vibrations. Do not require special tubing preparation before applications. Looking for Hastelloy Forged Fittings ?